This popular and delicious eggplant preparation can be used in different ways on your dining table. 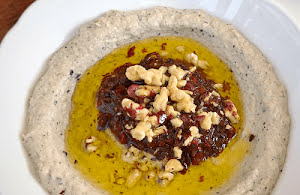 Fresh Baba Ganoush tastes best though you can keep it for up to 2 days in a refrigerated form. To give a different touch, I've used a unique garnish of chargrilled bell peppers and walnuts. It is optional and you can go with your preferred or a common garnish generally used for Baba Ganoush. I generally serve it as a dip for different types of appetizers. You can relish it with pita bread too. Use large eggplants to get the best texture and flavor. If you want to make a spicier version of the same, do not hesitate in adding few chili flakes. Let's make this lip-smacking and nutritious eggplant recipe in a few easy steps. Do try this scrumptious, nutritious, and fulfilling eggplant preparation that’s not only easy-to-make but also leaves a long-lasting flavor on the taste buds. Preheat oven to medium heat. Slice both the eggplants and apply sea salt. Keep aside for 15 minutes. Drain all the excess liquid released from the slices. Pat dry each slice with a paper towel and apply olive oil on them. Arrange the slices in a baking sheet and place on the top rack of the oven. Roast for 10 minutes each side. Remove the skin and add to the food processor with garlic cloves, tahini paste, lemon juice, ground black pepper, and sea salt. Blend till all the ingredients are combined well into a slightly coarse paste. Remove the bell pepper seeds and stem. Coarsely chop. Drench in olive oil and roast on an open charcoal grill for 3 to 4 minutes. In a serving plate, make a base of baba ganoush and top it with a generous scoop of chargrilled bell pepper. Add generous quantity of olive oil and garnish with walnuts.